An enigma to those who knew him, the early-20th century French master Maurice Ravel composed some of the most popular and beloved music in the repertory. In Ravel: A Listener's Guide, Victor Lederer surveys and explores this master's refined and utterly distinctive oeuvre. Ravel is often mentioned in the same breath as his older contemporary Claude Debussy, but the works of the two composers display as many differences as similarities. Where Debussy rejected existing forms, the structuralist Ravel embraced the baroque suite and classical sonata form as vehicles for his ideas, in addition to his own concise inventions. At his best, which is where we usually find this focused stylist, passion flows just beneath some of the most exquisitely crafted surfaces in music, under which lurk ironies that raise as many questions as they answer. A perfect example is Boléro, Ravel's most famous work; Lederer analyzes the music and looks at the outsized role it has assumed in our culture. 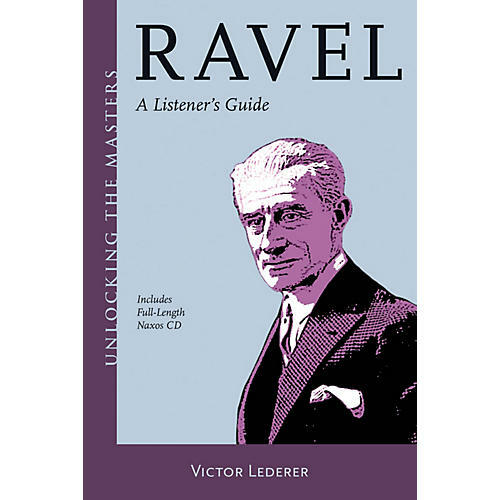 Lederer walks the reader and listener through Ravel's relatively small but crucial contributions to orchestral, vocal, chamber, and piano music. Ravel's two operas, idiosyncratic and underappreciated, are examined in detail as well. The book includes a Naxos CD with examples from across the master's career.